Why o WHY must you all be fed at 4:15 AM?!?!?!! The three of them all lined up are adorable! Black cats are the best. For the same reason the dog has to pee at 3 am. Aww what cuties! Are they all siblings? My cat Dexter looks a lot like the three of them. Cuz we luvz u and wantz qualitee time b4 u haz to go 2 work. 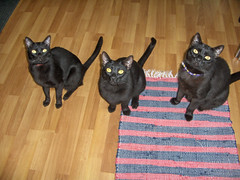 None of them are related - from left to right, they are Dobson, George & Carmine. Carmine was adopted from Contra Costa County SPCA 10 years ago (he was in the shelter for 11 months before I brought him home on 11/09/98). Dobson was adopted in June 2004, he was born April 1, 2004 and fostered from Oakland SPCA at a friend's house. All his brothers were already adopted and he was the last kitty in the porch on the side of their house - mewing piteously at the top of his lungs. Turns out he's just always that loud. George was adopted by upstairs neighbors from Berkeley SPCA in April or May 2005. They thought 1 year old Dobson was so cute and went and got a black kitty buddy for him (though they thought they were bringing the kitty for themselves). George's bday is around March 15, 2005 (gotta check. Dobs & George were instantly in love - I have never seen any two cats who more instantly got along. Dobs has many many tricks for waking me up. He's a very bad kitty. B/C they know you are asleep! I can't top what Fake Plastic Fish said, so I won't even try! My kitty wakes me up anywhere between 1:30 and 5:30 to be fed, but it's usually around the 2 or 3 a.m. hour!